If the chronic pain of a herniated disc is keeping you home from work, turn to John Regan, MD, to restore your quality of life. 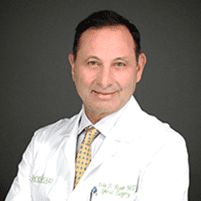 At Spine Group Beverly Hills in Los Angeles County, he offers comprehensive diagnostic and treatment options for relieving the pain of a herniated disc, including disc replacement surgery, if necessary. Find out what Dr. Regan can do to end your pain by calling for a consultation in his Beverly Hills or Santa Monica office or booking one online. A herniated disc is a condition that affects the gel-like cushioning sections of your spinal column. Each disc has a tough exterior with a soft center, and when the disc herniates or ruptures, the soft center can push through the outer layer. There are several factors that can cause the rupturing of a disc. In many cases, the herniated disc is the result of the natural aging process. Wear-and-tear on the discs and degenerative diseases can cause the discs to lose water, making them more susceptible to tears and ruptures, even with minimal movement. If you lift or move heavy objects without using the proper safety techniques, you may also be at risk for herniating one or more discs. A herniated disc can cause persistent irritation to the nerves surrounding the spine. This can cause chronic pain in your back and numbness or weakness in your legs and arms. In some cases, you can have a herniated disc without any symptoms. Dr. Regan first reviews your medical history and symptoms. He performs a physical examination of your back, checking for tenderness and assessing your flexibility. He may also use a myelogram test. In this test, dye injected into your spinal fluid can show pressure on your spinal nerves during an X-ray. Nerve conduction studies are also available to measure the electrical impulses of your nerves, which can determine areas of nerve damage in your spine. Initially, Dr. Regan may suggest using over-the-counter or prescription medications to control pain and reduce any swelling. He may also suggest cortisone injections to reduce inflammation in the surrounding tissue. If physical therapy and medications aren’t effective in relieving herniated disc symptoms, Dr. Regan may recommend minimally invasive disc replacement surgery. End the pain of a herniated disc forever. Call Dr. Regan’s office or use the online booking feature to schedule an appointment.